Posted May 3, 2017 by finnfemme & filed under Fashion, Vintage. 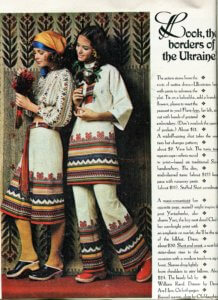 I ran across these fabulous Slavic/Ukrainian fashions in my February 1971 issue of Seventeen magazine. This folkloric style was extremely popular in the 1970s, and is experiencing a resurgence with the Neo-Folk embroidered designer dresses of Vita Kin and Ulla Johnson in 2017. 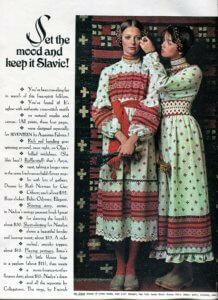 Needless to say, my love of this style is just as strong today as when I wore it in the 70s! 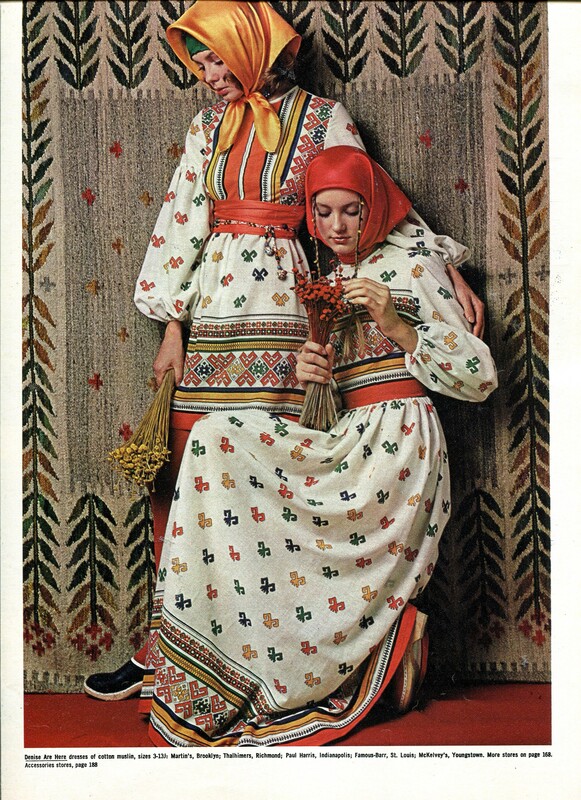 The prints were designed especially for Seventeen by Aquarius Fabrics. 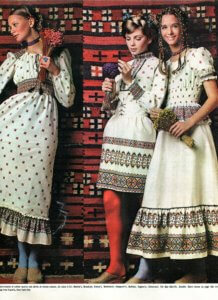 They had authentic cross-stitch motifs on Natural muslin and canvas. Models Olga and Anya are wearing frilled midi dresses by Ruth Norman for Gay Gibson. 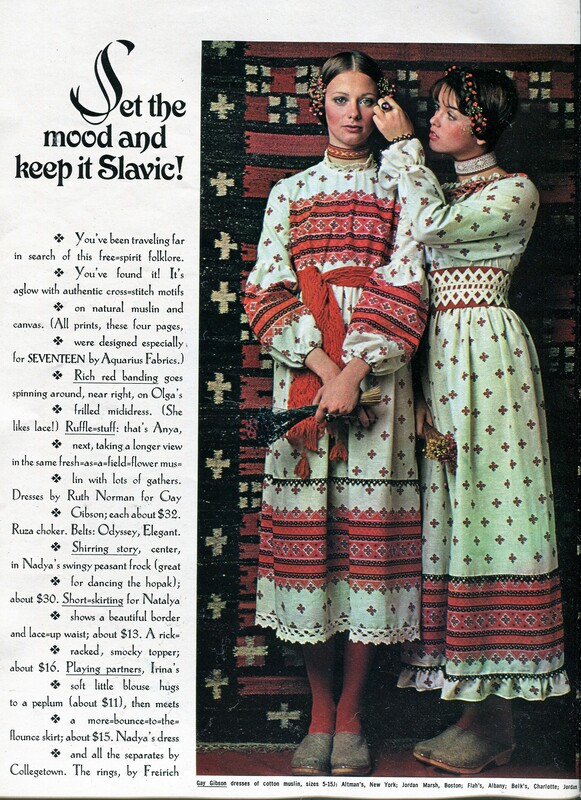 Nadya is wearing a swingy peasant frock, Natalya is wearing a skirt, blouse and lace-up waist, and Irina is wearing a skirt and blouse. All by Collegetown. 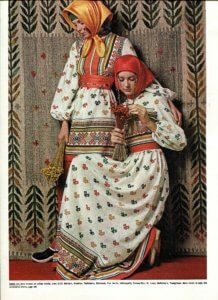 The prints are based on traditional Slavic handcrafted embroidery. 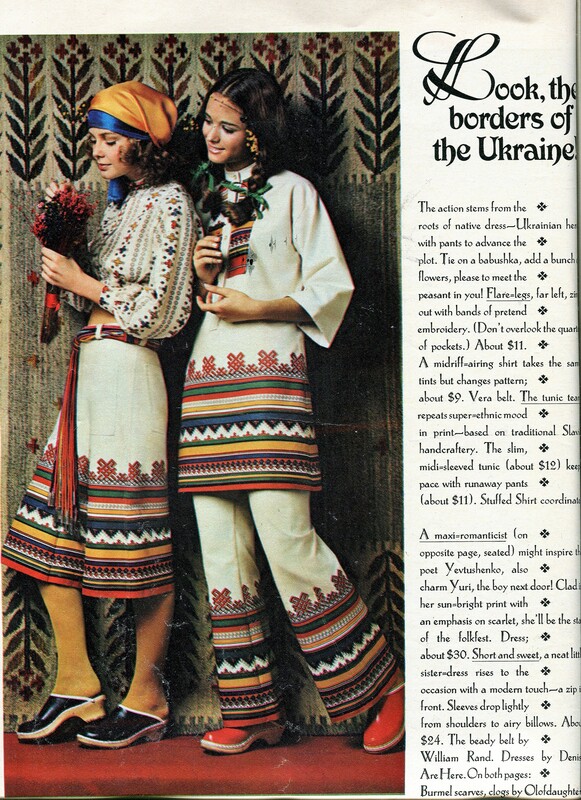 Culottes and midriff-airing shirt worn along with a babushka. 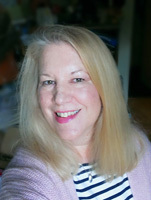 Slim midi-sleeved tunic top keeps peace with runaway pants. All by Stuffed Shirt. A maxi-romanticist might inspire the poet Yevtushenko, also charm Yuri, the boy next door! Maxi and mini dresses in cotton muslin by Denise Are Here. Beady belt by William Rand. May this fab style live on forever!